New Cross, near Deptford was the location for one of the second phase of infectious diseases hospitals erected by the Metropolitan Asylums Board which had been set up in 1867 to administer care for certain categories of the sick poor in metropolitan London. The Deptford Hospital, serving the south-east of London, and its contemporary establishment, the Fulham Hospital, serving the west, were erected to provide additional accommodation for the large numbers of smallpox cases that continued in spasmodic epidemics in the 1870s. With the existing sites at Hampstead in the north-west, Homerton in the north-east, and Stockwell in the south-west, the two new hospitals created a ring of five serving the whole of the capital. The Deptford Hospital was erected in 1876-77 on a site to the west of Avonley Road at New Cross, Deptford. It was formally opened on 17th March, 1877, a week after its sister hospital at Fulham. The architects of both new hospitals were J Walker and W Crickman. The New Cross site location and layout are shown on the 1888 map below. South Eastern Hospital site, 1888. Initially, only the central portion of the hospital was erected as a permanent structure, running east to west. This contained the administrative offices, staff accommodation, kitchen and laundry blocks. The ward blocks were planned to be temporary structures to be added when required. This turned out to be sooner than anticipated in the autumn of 1876 when a new smallpox outbreak occurred. It was then decided that thirteen ward pavilions should be erected, six to the north of the central buildings and seven to the south. An ambulance station was also located at the hospital. During the smallpox epidemic of 1876-8, a shortage of suitable women resulted in the then novel step of the male wards being staffed entirely by men. The medical superintendent later pronounced that they were much preferable to women and 'better fitted to maintain order among the patients, who were from the lowest class of the population'. In 1881, a Royal Commission was established to examined the arrangements for dealing with infectious diseases in the capital. In its report the following year, one of its main recommendations was that smallpox cases should be treated in isolated hospitals on the banks of the Thames or in floating hospitals on the river itself. As a result, from 1884, the Deptford Hospital became primarily a fever hospital and was renamed the South Eastern Hospital. The majority of smallpox patients were then treated on the MAB's hospital ships Atlas, Endymion and Castalia, moored on the Thames at Long Reach near Dartford. The layout of the hospital in 1893 is shown below. South Eastern Hospital site, 1893. In 1930, administration of the hospital passed to the London County Council. The South Eastern remained a fever hospital up until 1941. 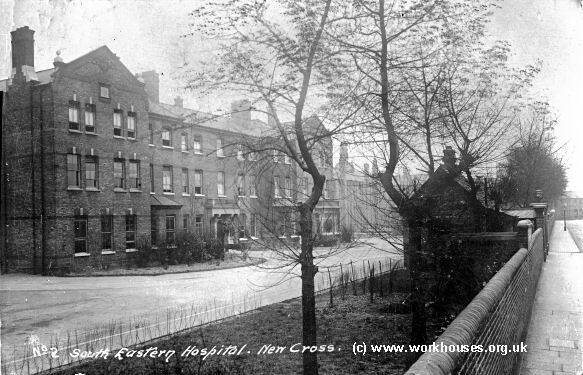 After 1948, it became New Cross General Hospital, then from around 1964 as New Cross Hospital. The hospital closed in about 1991. The southern part of the site, known as Wardalls Grove, is now occupied by a number of businesses together with NHS offices, with the old hospital mortuary still standing just inside the gateway. 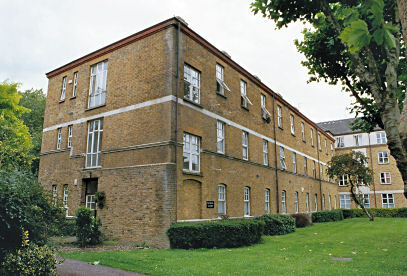 In 2004, one original ward block remained but has since been demolished to make way for modern housing. Some former hospital buildings still survive at the far north of the site.